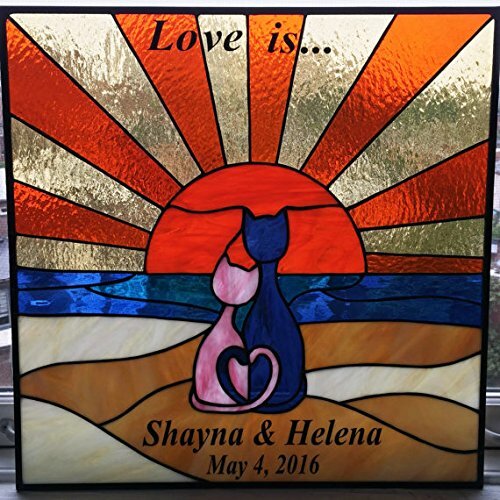 This lovely stained glass panel was a wedding gift for our customer's sister. Size is 20x20. As you can see on the photos, we used Vinyl for the text. This is a cheaper option and it also avoids all the cut lines that we'd have to include if we created text with glass. 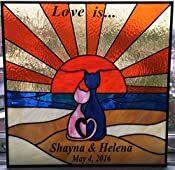 Stained glass panels are original gifts for special ocassions so, if you really want to surprise your loved ones, you are on the right place! This can be ordered in any sizes and color that compliment you decor. Contact us to begin your custom project today!!"